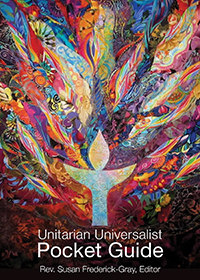 Thank you for this opportunity to share with you today some of my reasons for being a Unitarian Universalist and what it is I am seeking in this pursuit. As I told Beth when I somewhat reluctantly agreed to make this presentation, I am a little reticent about doing this because unlike some who have spoken so eloquently before me, I do not really bring much of a questioning or inquiring perspective to this endeavor. Unlike the deeply personal and very poignant presentations we have seen from Lynne and Maureen and others where they shared some of their philosophy related to this religious undertaking and questions they might have in regard to it, I will not do that. I really bring very little in the way of philosophical questioning or introspection to this undertaking. And the reason for that is this. I have looked at the seven principles we covenant to affirm and promote. I have looked at our mission statement. And I am good with them. I accept them and agree with them. There is no debate in my mind in that regard, and thus I am at some level just a blind follower at this point, and happy with that. I affirm and promote “the inherent worth and dignity of every person.” I am on board with that. I will promote a “free and responsible search for truth and meaning.” No problem, sign me up. We will seek a world with “the right of conscience and the use of the democratic process within our congregations and in society at large.” I fully agree with that and do not question it. And so on. Likewise, our mission states that we will be a religiously liberal and welcoming community. We are united in a responsible search for knowledge and spiritual growth. We are bound by no dogma or creed. I really love that one, and remember that was Kathryn Logan’s contribution when we developed the mission statement four or so years ago. We value peace, liberty, social justice and environmental sustainability. Again, I am completely comfortable with all of these things and fully support them. So I am not really questioning any of that, and am not particularly interested in doing so. uninterested in doing that sort of thing. I want to just accept them and make them a factor in how I conduct my life. decided to just accept our principles and mission with little further questioning. Now I also recognize that things can be more difficult and uncertain than I am allowing myself to open up to. Adhering to a principle that calls for recognizing the inherent worth and dignity of every person when there are some people out there who want to eradicate us is a difficult problem and probably calls for some discussion and reconciliation. But not from me. much better, at not only accepting this vision of life that we espouse but also living it and acting in accordance with it. I do pretty well with some things, like respecting the interdependent web of all existence which we are a part of. But I do not always do as well with other things. I know I can use improvement in walking the walk of respecting the worth and dignity of every person. I don’t always do that. So I need to work on that, and that is what I most seek here. Fortunately, I believe that many of the services Beth and Ellen have been bringing to us are helping me to better see how to walk the walk. Like the intergenerational service a few weeks ago—I thought that was a veritable lesson in how to better really live and embody UU principles. Thank you for that. And with that I will stop and thank you all for this chance to share these thoughts.